Read-out Instrumentation Signpost: We love STEM! Schoolchildren have fun-packed and educational day of hands-on activities loving STEM in automation facility. Emerson has hosted its latest ‘We Love STEM’ outreach event in Britain, helping to inspire the next generation of engineers required to meet the manufacturing industry’s current shortfall. More than 40 children from four local schools attended the STEM Inspiration Day to encourage interest in science, technology, engineering and maths. 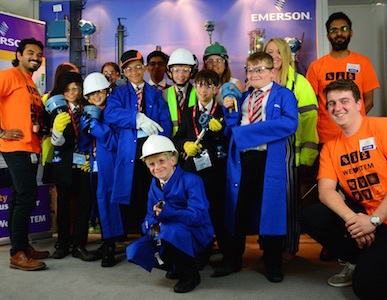 Pupils aged 11 and 12 from Burnham Grammar School, The Beaconsfield School, Bourne End Academy, and St Michael’s Catholic School in High Wycombe were invited to attend the fun-filled and educational visit to Emerson’s facility in Slough. The children took part in a series of activities throughout the day, including a tour of the factory, a chance to see what happens in the engineering research and development department, and hands-on STEM challenges that tied in with their physics and chemistry syllabus, including building a dynamo-powered torch. The children also enjoyed interactive demonstrations of how Emerson’s Rosemount brand of measurement products manufactured in the Slough facility are used in oil and gas, power generation and food and beverage production. The day was co-ordinated by members of Emerson’s Women in STEM organisation that provides networking, professional development, and volunteering and mentoring opportunities for the company’s employees. “What a day! The students were inspired, teachers energised, and Emerson staff clearly motivated by the event’s success,” said Jackie Campbell, Skills Development Manager at Bucks Skills Hub, which connected Emerson with the local schools ahead of the event. Emerson is committed to supporting STEM projects around the world, and its award-winning ‘We Love STEM’ initiative aims to encourage talented young people to enter STEM industries. 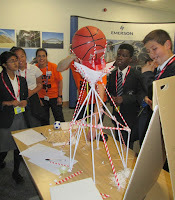 The Slough event is part of a series of STEM activities in Britain that Emerson supports. These include attending Big Bang UK Young Scientists & Engineers Fairs, hosting STEM school outreach activities at its facilities in Leicester and Aberdeen, and appointing STEM ambassadors to engage with local communities to encourage students to consider STEM careers. In partnership with YouTube star and self-proclaimed science nerd Hank Green, Emerson’s ‘We Love STEM’ initiative offers a variety of resources, such as inspirational videos, a Twitter feed and outreach events around the world, to help motivate the next generation of innovators.